The Phonebook is the stock Android app, which hasn't been changed since its major redesign last year with the introduction of Ice Cream Sandwich. It's made up of three tabs that you can switch between with sideways swipes. The middle tab is the default one, listing all of your contacts. Contacts are listed with a name and a picture to the right. They can be sorted by first or last name, and viewed as first name or last name first. There's a permanent scroll bar available that you can grab and jump straight to contacts starting with a certain letter. There's regular search as you type too. The quick contacts feature triggers on tapping a contact image to bring up a tabbed popup window. The tabs are phone and email with a list of the available numbers or addresses. These tabs can be navigated with sideways swipes as well. The single contact view displays the contact's name along with a star to favorite a contact and a Settings button that lets you edit, share or delete a contact, as well assign custom ringtones to them or set the phone to redirect calls from that contact straight to voice mail. Under that is a list of all contact info sorted by category - phone numbers, emails, events, notes and so on. The contacts that the phonebook displays can be filtered by service (e.g. hide all Facebook contacts) and even group (so you can hide all contacts that don't belong in a group, for example). The other two major tabs in the phonebook are Groups and Favorites. Groups are listed by service (e.g. your Gmail account), while favorites are a listed as a grid of large contact photos, which is readily thumbable. In-call quality was on the positive side. In spite of being acceptably loud, it tends to drop off in areas of spotty coverage. The secondary microphone for active noise cancellation of the Padfone 2 definitely helped it retain the quality of voice even in noisier environments. The dialer features Asus-styled themes and, unlike stock Android, has grown a smart dialing feature, which is a must in every new smartphone of this day and age. The dialer is just the first tab of the phone app, the other two being the Call log and the Favorites tab (you get the same in the Phonebook). In the Call log, you can't delete individual entries, which was mildly annoying. Asus has built in a handwriting-based input for the dialer as well. 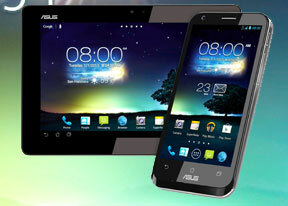 We also ran our traditional loudspeaker test on the Asus Padfone 2. It scored a Average overall mark which means you might consider enabling vibration in noisier environments. The Padfone 2 Station, however, managed to score a bit higher than the Padfone 2, probably thanks to the bigger speakers inside it. The messaging section is business as usual but with some improvements. All SMS/MMS communication is organized into threads - each thread consists of all messages between you and one of your contacts. A cool new feature is that you can select multiple threads to mass-delete. Each thread is presented as an IM chat session, the latest message at the bottom. You can manage individual messages (forward, copy, delete) and even lock them to prevent deletion. You can use search to find a specific message in all conversations. Quick contacts work here too and there's a call shortcut at the top of the screen when viewing a thread. You can set the Padfone 2 to delete older messages (by default, it keeps 500 texts and 50 MMS). You can activate delivery reports and read reports too (they are notifications that the receiver has read the message). Composing a text is still frustrating as the text box starts off as a single line and grows only up to three lines, which makes working with longer texts hard. We mostly let it slide on previous versions, but with a 4.7" screen there's no excuse not to make the text box bigger. You can add multimedia (photos, videos, sounds, etc. ), which will convert the message to an MMS. If you need multiple slides or multiple attachments, you can use the full-blown MMS editor as well. A cool new feature in Gmail is that you can swipe left or right to move between messages in your inbox. The shortcuts on the bottom of the screen are new email, search, labels, refresh and settings. Unlike its Gmail counterpart, this app supports a combined inbox view. It color-codes the inboxes so you can easily tell where each message came from. Unfortunately, there's no moving between messages with sideways swipes here. As you would imagine the keyboard is pretty comfortable to use on the large 4.7" display of the Padfone 2. Keys get even bigger when you switch to landscape mode - the long screen becomes very comfortable for two-thumb typing. If you require even large keyboard, the Padfone 2 Station comes into play, as it provides a near full-size keyboard typing experience with its 10.1" display. However, holding the slate with two hands in an attempt to type may not be ideal for people with smaller hands. Asus has an alternative method for text input dubbed Trace input. It works in a manner very similar to Swype -- you just Swipe your finger over the letters you want to type, lifting after each word is complete. Naturally, the Trace input typing feature benefits from the already existing Android word prediction, so you can just tap on the words the keyboard suggests. A tap on the text area will reveal a "handle" attached to the text cursor - it's easy and more accurate, which makes correcting mistakes easier. A double tap will bring up the select options - select word and select all - with two handles to adjust the start and end of the selection. If a word has a typo, it will be underlined in red and when you tap it, the phone will offer a number of suggested corrections along with options to add the word to the phone's dictionary or just delete it altogether.